Rep. Mo Brooks (R-AL) was on the Dan Morris Show on WACV FM Talk Radio, Montgomery AL on Thursday. Rep. Brooks was one of the first to be able to offer aid to Steve Scalise the day a Bernie Sanders supporter shot up a ball field of Republicans in Virginia. 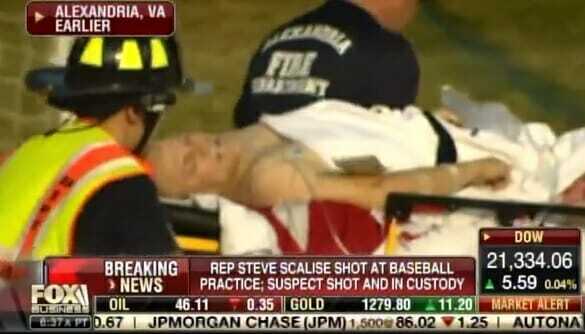 Rep. Steve Scalise has been hospitalized since that day. Scalise was readmitted to ICU on Wednesday night. On air at 12:35 CST Mo Brooks told host Dan Morris that Scalise is going to need TWO YEARS of reconstructive surgery and physical rehab. Rep. Mo Brooks: My buddy Steve Scalise is still in the hospital with some very serious injuries that’s going to take, if things go right, it will be about a year or two before he’ll have recovered with all of the rehab and reconstructive surgery. Dan Morris was in the Reagan Administration and a “Trumpophile” a year before the 45th president declared he was running.